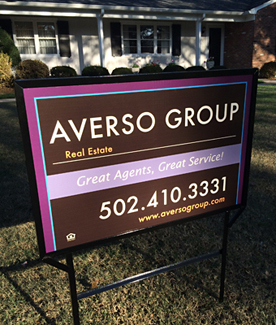 Averso Group LLC is independently owned and brokered by John Stines in the state of Kentucky. Our goal is simple – to provide our customers with Great Service from Great Agents. We function in a virtual office model for independent contractor sales agents who thrive in an environment of working out in the community and from home, rather than in a stuffy, unproductive cubicle in a brick and mortar office. With lower overhead, we offer all agents a 90/10 split on their commissions with NO FEES and no buy-ins or hidden charges! Agents don't have to pay anything to receive this great commission split! No matter how much or how little you sell each year, your income potential is maximized with our company. With lower overhead, we offer all agents a straight 90/10 split on their commissions, with no fees or hidden charges. Agents don’t have to pay anything to receive this great commission split! No matter how much or how little you sell each year, your income potential is maximized in our company. Do the math for your personal situation and see how much more money you can earn with a 90/10 split! This can be as high as an 80% increase in income! If you are currently paying fees just to get your split, then the increase in earnings goes even higher! What's it like to work for Averso Group? In one word, "different." Just about everything is different. It starts with your broker being helpful and grateful while answering your questions and addressing your concerns. With no brick and mortar corporate box to pay for, all Averso Group agents receive the top commission rate of 90% with absolutely no fees or commission payoffs. Unlike other companies who take a big chunk of the commission to pay for staff and spaces they sit in all day, ours is an active brokerage where we meet when you need to and want to, and John is available 24/7 by phone, email, and Skype if needed. No questions are dumb, no concerns are dismissed, and John does not misuse the precious relationship between broker and affiliate, like some companies naturally do. Working for us is being a part of a company effort, a piece of a whole, and there is the same daily business to do as with box store brokerages. If you are ready to graduate to the future, Averso Group is the choice. We are looking for a few Great Agents who know how to give Great Service! Our business promise is our philosophy put into action. Although we have no central brick and mortar offices, John meets with agents individually or at times in small groups to discuss training issues that arise. No one is left out of this process, nor will you ever feel left out or steamrolled by the popular "rock star salesperson of the month" type of hype. A principal broker needs to listen, train, educate, encourage, provide, and best of all, be on the same team. Whether you sell 100,000 a year, or 10 million a year, everybody is equal, paid 90%, and treated with respect. Part-time or full-time is up to you, you are your own boss in this business, and John is there to teach and help out. Period. As your broker, John stays actively engaged 24/7 so he can provide information, training, guidance, Q & A sessions, legal resourcing, and general help to all agents. We have an “open door policy” so we can meet in person or talk over the phone at any time needed, and stay focused on what you really need from a broker. Everyone is important and every agent is appreciated. Questions are encouraged and your presence in our company is always valued. Check out John's Agent Profile for some background on the principal broker himself and why he is in this business. Our professionally designed, bold, colorful graphics used for yard signs, directional signs, business cards and on our web site coordinate to create a recognizable brand that buyers and sellers notice and remember. We provide free, attractive, two-sided business cards for every agent, as well as our colorful, catchy yard signs and open house directional signs. Our web site features a colorful, easy to navigate design with agent profiles and other informative functions. Teams are encouraged so they may sub-brand to create a market presence tied to your name(s). Team graphics may be custom-designed to preserve the team sub-brand on business cards and yard signs, which are still provided at no cost to all team members, as well as bio and contact pages on our company web site. We pay $250 to you for each associate you bring to the business through your referral! Build a team, work with a partner, create out of state referral relationships. However you generate commissions, you will receive 90% of that gross amount. Ready to move up and on to your future as a well-paid and appreciated agent? 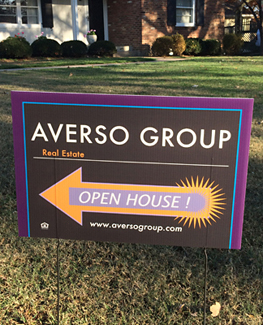 Let's sit down and talk and see if you are a good fit for Averso Group! Our large, colorful yard sign in action! Catchy directionals for your open house!